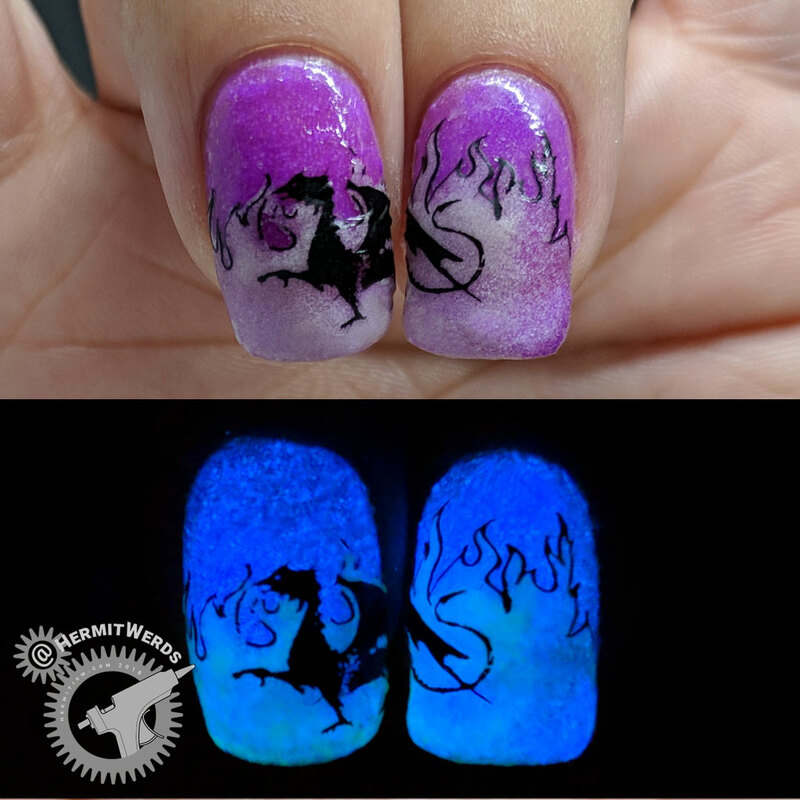 I’d originally meant to review this glow in the dark powder with the bat manicure that you will be seeing tomorrow, but #liganailistachallenge had a dragon prompt and I had this lovely image of Malifecent as a dragon on Maniology’s Happily Never After BM-XL193 stamping plate. How could I not make that glow in the dark? Impossible. So far I have tried out Beauty BigBang’s J2103-3A, J2103-10A, and J2103-11A (although J2103-10A wanted to photograph green instead of the light orange it was, possibly due to using my led gel-drying lamp to charge it). I’ve liked them all. The different colors are obvious and delightful, so plenty of quality there. They do end up being gritty so you need lots of extra top coat if you apply it like I do (maybe even a glitter food top coat). And removal takes a little bit more time, which is why I used peel off base this time and was betrayed. Ugh. 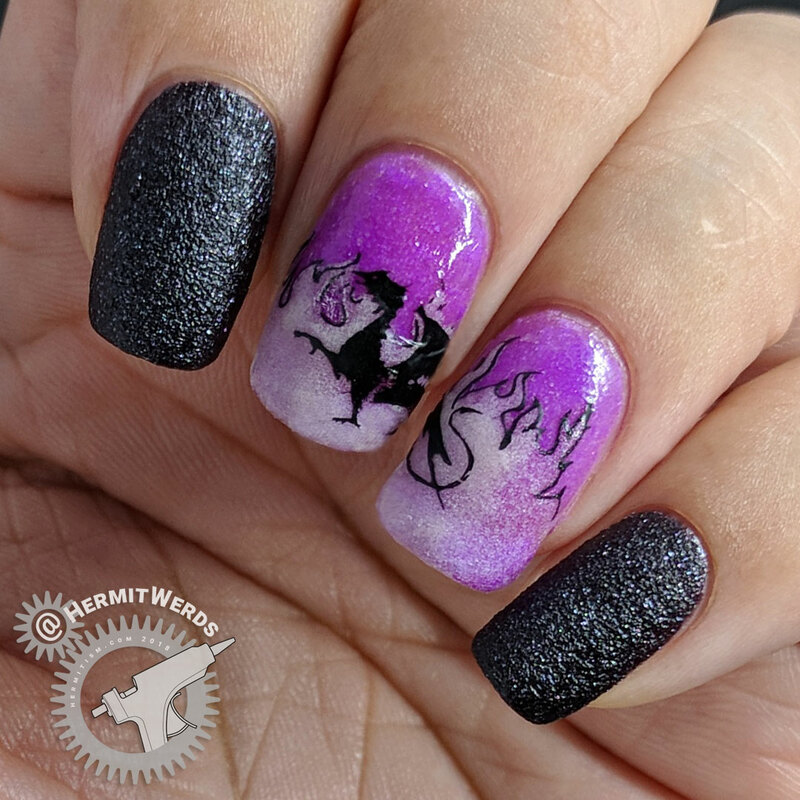 Last time with the owl nail art, I first painted a base of regular polish, then a layer of powder mixed with clear polish (which turned out lumpy), and then two layers of dusting the powder over wet clear polish and brushing off the excess. This gave me a slightly mottled appearance which I believed was caused by the lumpy layer. I think today’s swatch confirms it. For today’s swatch I only used two layers of wet clear polish dusted with powder + a little touch up on the edges after checking for glow quality under my led lamp. I threw on two layers of top coat, which didn’t quite smooth down its surface, and went to bed with solidly purple nails. I woke up the next day and found that after washing my hands a few times I now had visible nail line. So if you don’t want that, you will need to put down a coat of some other polish color, although possibly a non-peel off base coat would have helped. *sigh* However, if you don’t mind the look, it was really fun last night to be able to see the glow in the dark qualities from both sides of my nail (of course, you need suitably long nails to be able to enjoy that). 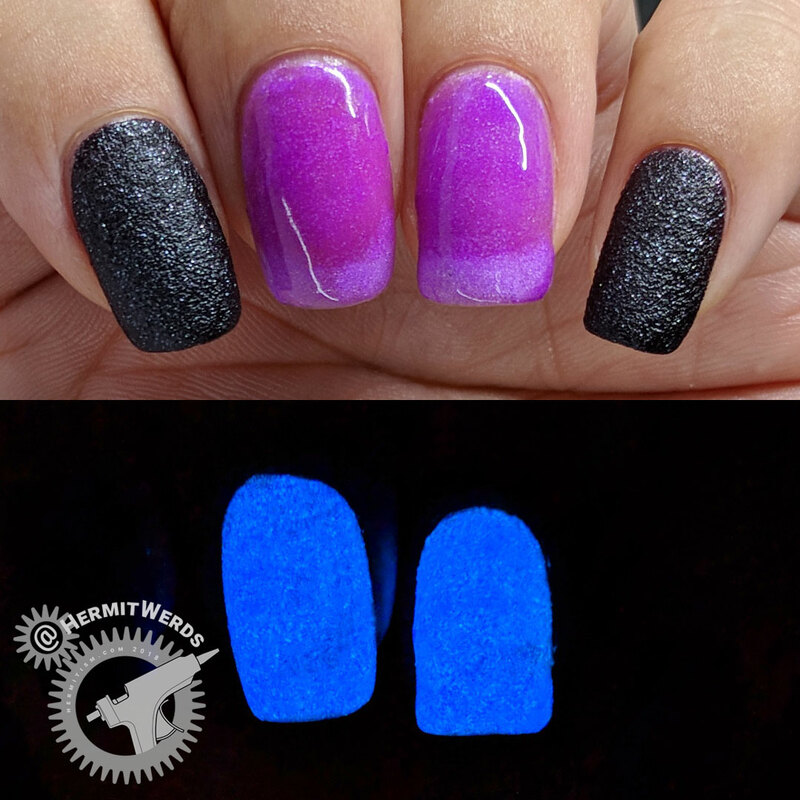 The swatch photos were taken with a third coat of top coat. Time for some Malifecent love! I used a glow in the dark acrylic paint in my decal (and got it to work this time). It took many layers to reach the opacity I have (and lots of checking with my led drying lamp). It took forever to dry. Seriously, I held it in front of a fan. 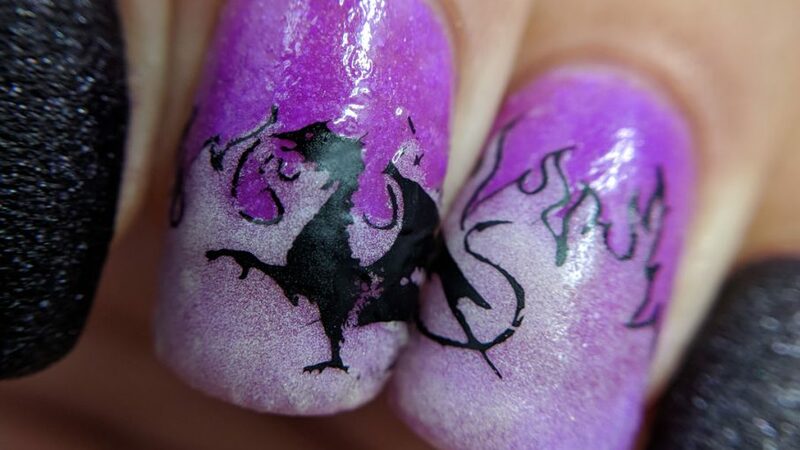 The decal was brittle by the time I applied it to my nails and didn’t go on as smoothly as I could have wanted. I used pure acetone on my cuticle cleaning brush and gently tapped on the ridges that had formed to “melt” them down. I didn’t loose too much paint doing it, but I was worried. I also enjoyed that the original bright green glow of the acrylic paint turned into a light blue when applied over an already-glow-y nail. I’d played with the idea of painting an undercoat to prevent color mixing, but I’m glad I didn’t in this case. Decal-ing with an undercoat is just another little experiment I will have to perform later. 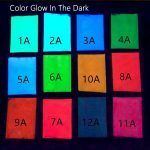 Don’t forget to use my code (hermi) for 10% off your order of the glowing stuff at Beauty BigBang. Thanks again for sending these to me, Maggie!